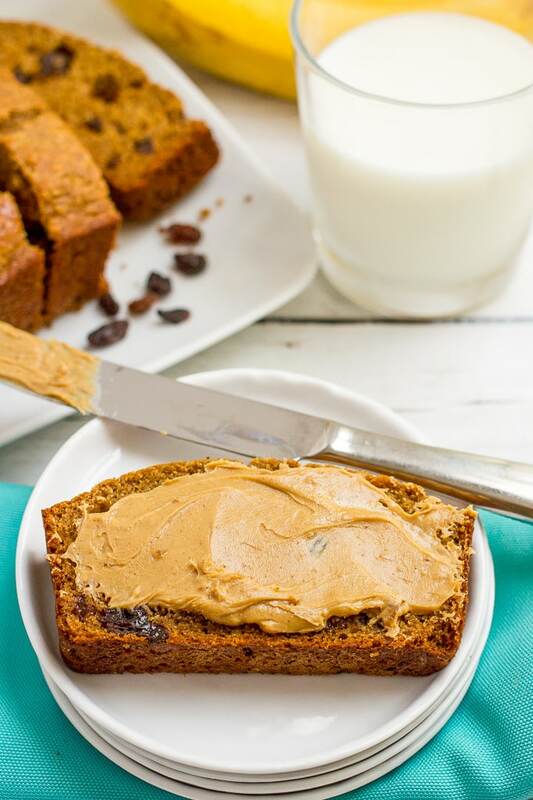 This easy whole wheat cinnamon raisin bread recipe requires no yeast, no kneading, no bread machine. It’s lightened up, soft and so delicious! Cinnamon raisin bread just speaks family to me. I guess it started with my Dad, who loves cinnamon raisin bagels, cinnamon raisin bagel chips, cinnamon raisin English muffins – you name it. Cinnamon raisin bread, too, but he prefers it toasted so it gets a little crispy. He spreads it with butter while still warm, so it melts right into the bread (or bagel or muffin) and crunches on into it. And so it happened one day that I saw cinnamon raisin bagels in the grocery store, while pushing my little ones around aisle by aisle, that I became nostalgic and wanted to share that with them. One look at the ingredient list though, and, well, didn’t buy anything that day. I did find a brand of cinnamon raisin bread at Trader Joe’s that was whole wheat and not half bad. We tried it out that weekend. I topped it with peanut butter for the kids and they gobbled it up, taking after their Pops (as they call my Dad). The loaf was super sturdy, which was great for storing it, but it always made me think it was a bit stale. So of course I came up with my own homemade recipe that’s whole wheat, naturally sweetened and full of real food ingredients. And oh wow, what a difference! No hard bread here, no indestructible loaves that can sit around for ages. 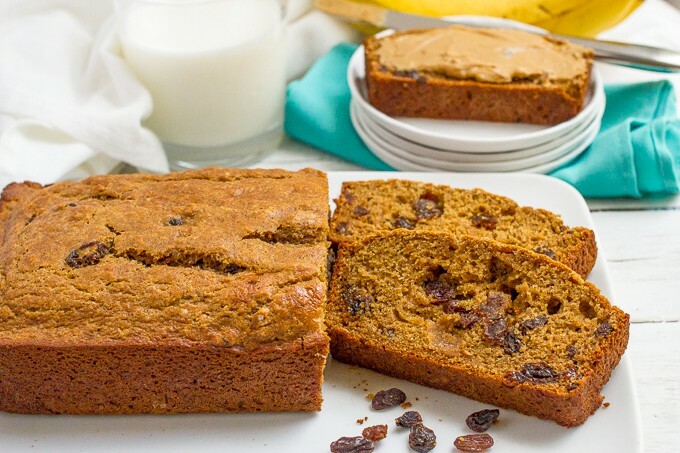 This whole wheat cinnamon raisin bread is unbelievably soft and moist. It melts in your mouth and just floods you with warm, comforting emotions. I freeze and save the other half of the loaf for the next weekend – unless my husband and I devour it that same day – and so I’m quickly back to making more. I’m lazy so I use one bowl to make this bread. If you make a well in the center of the flour mixture and stir together your wet ingredients there before mixing them with the dry mixture, you’ll be fine. This bread has a lot of raisins. Raisins running throughout it. No bites without raisins. 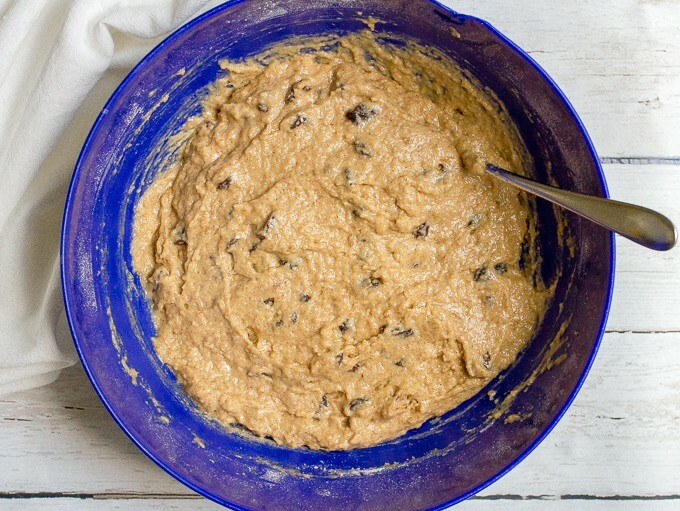 You can reduce the amount of raisins to 3/4 cup if you’d prefer. 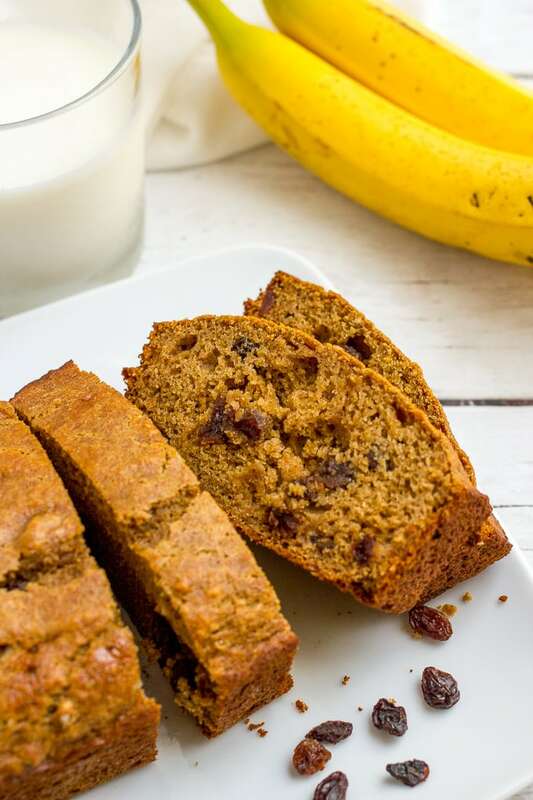 Be sure to break up the raisins as you measure and add them – you don’t want huge clumps of raisins stuck together in your bread. I highly recommend you double the recipe so you can make two loaves at once. 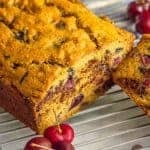 Freeze the extra (as a whole loaf or in halves, depending on how much you eat at a time) and defrost in the refrigerator overnight. Or give the extra loaf to a friend or neighbor! I freeze my breads by wrapping them first in saran wrap then in aluminum foil. I write the contents and date on the aluminum foil and pop it into the freezer. If you’ve ever been intimidated by homemade bread, this is a great starter recipe. 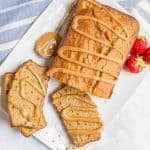 Quick breads like this that don’t use yeast, don’t need kneading and don’t require a bread machine will show you how simple it is. Happy weekend to all of you, and I hope it features some of this whole wheat cinnamon raisin bread. You know it’s what we’ll be having Sunday morning! 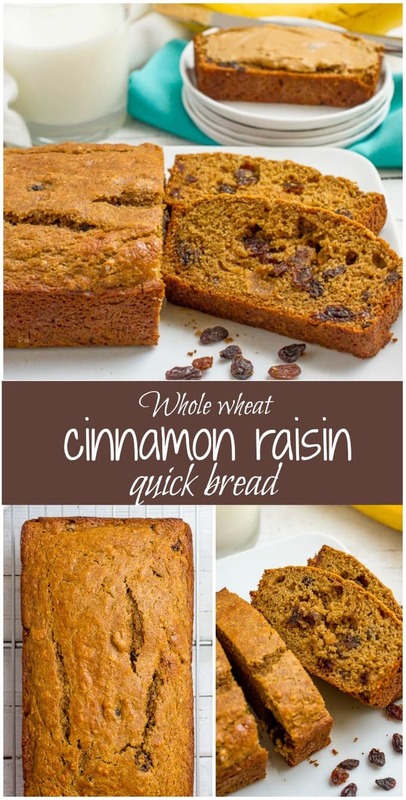 An easy no-yeast, no-kneading whole wheat cinnamon raisin bread recipe! Preheat oven to 325. Grease a 9x5 bread pan and set aside. Combine flour, cinnamon, baking soda, baking powder and salt in a large bowl and stir well. Make a well in the center and add the eggs, applesauce, honey, butter and vanilla. Stir the dry ingredients together a bit, then mix into the flour mixture until everything is well combined. Don’t overmix. Pour the batter into the bread pan and smooth the top. Let cool in the pan for 5-10 minutes, then invert onto a cooling rack and let cool completely before storing. The bread will keep on the counter for 3 days, in the fridge for a week or in the freezer for up to 3 months. This bread has a lot of raisins. You can reduce the amount of raisins to 3/4 cup if you’d prefer. Be sure to break up the raisins as you measure and add them - you don’t want huge clumps of raisins stuck together in your bread. 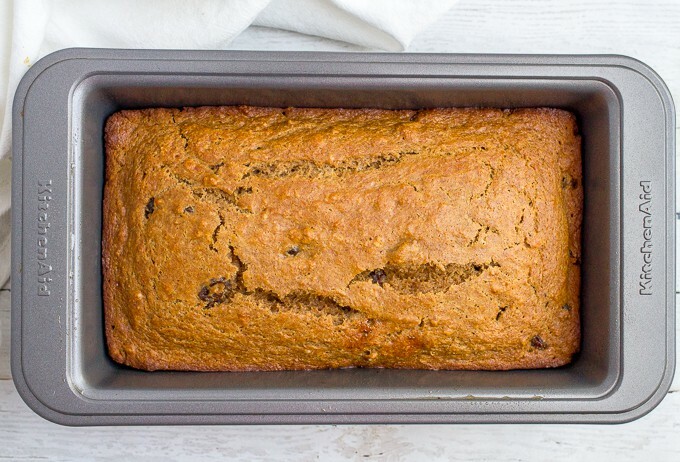 Cinnamon raisin bread is awesome and I love your version with no yeast and no kneading! It practically makes itself, lol 😀 I love bread fresh out of the oven with butter….you really can’t beat it! Hubby would love peanut butter too. Funny how your kiddos called your dad ‘pops’. I call my grandfather ‘pop’ and grandmother ‘nan’. 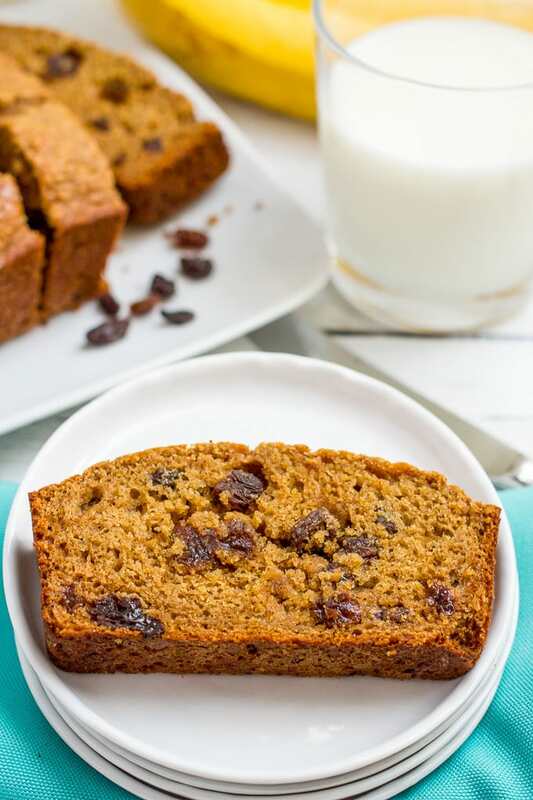 This cinnamon raisin bread looks so delicious! I love the way delicious loaves like this make my house smell! 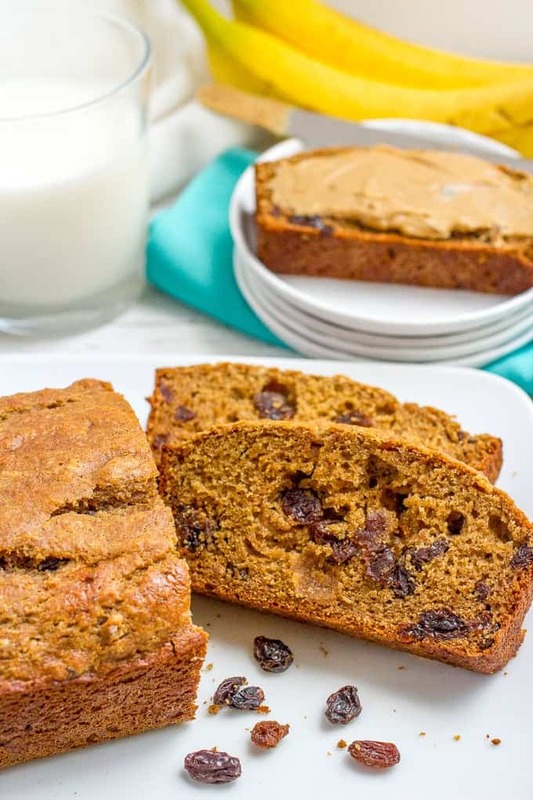 I love cinnamon Raisin Bread, I’m going to try this soon! You’ve got to – homemade is super delicious! Mmm raisin bread brings me back to my childhood! I love how easy your recipe is. Sharing! Right? Such good memories! Thanks Natasha! This looks delicious, I know I would love it. Definitely going to make this very soon! Thanks Anna! I hope you try it – it’s a favorite here! Hi, please could you recommend a substitute for eggs. Thanks. Hi Neha! 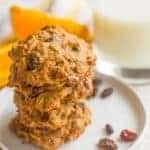 You could use a store-bought egg substitute (like Egg Beaters) or you can make a “flax egg” which is 1 tablespoon of ground flax seeds and 3 tablespoons of water to replace 1 egg. Hope that helps! 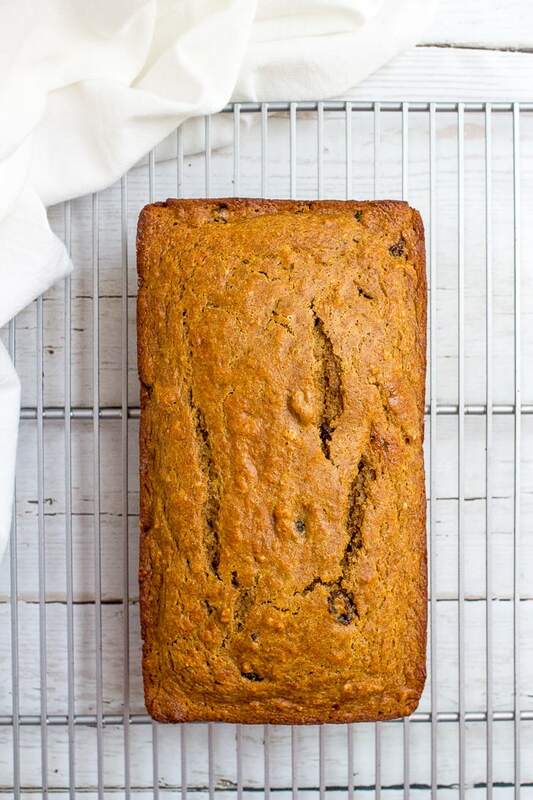 Could you use regular whole wheat flour in this ? I can not find white whole wheat flour here in N.S. This sounds great. Would it work if you put the mixture into muffin pans and made individual muffins? Presumably cooking time would reduce. Hi Helen! 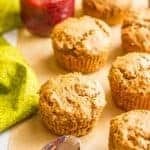 I make bread into muffins and muffins into bread all the time and while I haven’t done it with this recipe, it should work fine. The baking time will likely be somewhere around 20 minutes, you’ll just need to keep an eye on them. Would love to hear how they turn out! Been making these as muffins, worked out great. Cooking time is approx. 25 mins in my oven. Also added a tbsp of unsweetened cacao powder as I had some to use up, and a sprinkling of walnuts on top. My husband loves them as an afternoon snack! This recipe had good flavor and was very soft, but I had a hard time getting it to cut without falling apart. I let it cool overnight, and when I cut it this morning I had to cut fairly large slices to keep it from falling into pieces. Do you refrigerate yours before cutting? Hi there! I’m not sure why it came out so crumbly… mine always comes out and slices as cleanly as in the photos. I let it cool in the pan for a few minutes then turn it out onto a wire rack (or just some wax paper) to cool completely and then it’s fine. I don’t refrigerate it (until after it’s sat out for a few days, if I’m trying to keep some extra on hand) and I’m surprised that didn’t help with the texture cause that was a good idea to try! Sometimes too much flour can cause bread to go crumbly, as can overmixing the bread, if you think that could have possibly been the issue. Otherwise, you could try again and see if it sets up better the second time. I hope that helps! Any substitute for the apple sauce? I really want to try this tonight. Hi there! The applesauce acts as part sweetener, part fat substitute and part liquid so you’d need to compensate for those things. 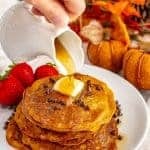 I think you should be able to substitute a combination of additional melted butter (or oil) and mashed banana for the applesauce (equalling 1 cup) or butter/oil, canned pumpkin and a bit of extra honey (to balance the sweetness). Would love to hear if you try it! I’ll let you know. Thanks for the rapid response! Excellent recipe! I doubled, which made a loaf and about 8 muffins. 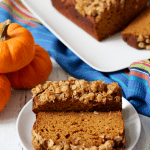 A few changes…I didn’t have enough applesauce so — since I doubled and needed 2 cups total– I used about 1/2 cup applesauce, 1/2 cup pumpkin puree, 4T butter and enough plain yogurt to equal 1 cup. Also used 1/4 cup sugar together with 1/4 cup honey. I was short on raisins so chopped up some dates. The texture was great, sweetness was perfect! Thank you for sharing. Oh I’m so happy you loved this Meri! I just made a double batch last weekend myself. 😊 And great notes on the substitutions – that’s really helpful, thanks for sharing! I substituted a small apple, diced, for the raisins and added 1/2 cup pecans. Also didn’t have a bread pan so I used a 8×8 glass dish. Baked for 40 min. It came out tasting like my mom’s old fashioned fresh apple cake. Love having a healthier version of that. Thanks for sharing the recipe! So happy you enjoyed it! And yum – I’ll have to try making it that way! WOW! I was absolutely blown away! This not only is the healthiest cinnamon raisin bread I’ve had, it’s also the BEST. This is going to be one of those recipes that gets passed down from generation to generation. Thank YOU!